Pneumonia is recognized to be the leading infectious cause of death among children under-five globally. It kills about 2,500 children every day and accounted for 15% of all under-five deaths in 2015 (UNICEF 2016). While most deaths resulting from Pneumonia occur in developing countries and about three-quarters takes place in just 15 countries, more than half of the world’s annual incident cases occur in just five countries: India, China, Bangladesh, Pakistan and Nigeria (WHO 2016). Pneumonia is defined by WHO (2016) as an inflammation of the lungs caused by bacteria, viruses and fungi. In pneumonia infection, the lungs which are made up of small sac-like features called Alveoli which are usually filled with air when a healthy individual breathes are filled with pus and fluid, making breathing painful and reducing oxygen intake (WHO 2016). November 12 every year is recognised as world pneumonia day. Introduced by global health leaders in 2009, this day is used to create awareness on the impact of pneumonia in children and advocate for interventions to protect against, treat and prevent pneumonia. If the current trend in child mortality resulting from pneumonia continues, the reduction of the under-five mortality SDG target i.e. 25 deaths or less per 1000 live births will not be achieved by 2030. This is especially true in the sub-Saharan Africa region where in 2016, 60% of all neonatal and under-five deaths occurred (Liu et al 2016; Golding et al 2017). It is therefore necessary that these countries in sub-Saharan Africa accelerate progress in meeting the SDG targets on child survival and thus prevent 60 million predicted deaths if nothing is done about the current trend (UNICEF 2017). In this article, I am going to examine the trends in Pneumonia infection in under-fives in Nigeria. I will look briefly at the nature, causes, prevention and treatment of pneumonia in children under-five in Nigeria. This section has attempted to provide a brief overview of what pneumonia is and the efforts made in combating it in children under-five. In the next section, I will look more closely at the epidemiology of pneumonia worldwide and in Nigeria. This section draws together the epidemiology of pneumonia worldwide and in Nigeria. As previously stated, pneumonia kills about 2,500 children every day and accounts for 16% of all death in 2016. According to estimates from the World Health Organization, each year, there are more than 150 million cases of pneumonia in children under-five, of which 20 million cases require hospitalization (Leung et al 2016). Morbidity and mortality from pneumonia is greater in low and middle income countries (LMIC). An estimate from the Child Health Epidemiology Reference Group (CHERG) puts the total number of pneumonia deaths worldwide in children under-five at 935,000 (Liu et al 2016). Sub-Saharan Africa takes the lead in having half of its under five deaths resulting from pneumonia compared to other regions (fig 1). Also, regional disparities exist in the percentage of under-five deaths resulting from pneumonia with 5% of deaths occurring in developed regions and 16% of deaths in Sub-Saharan Africa. Having examined the burden of pneumonia in the world, let us consider the burden in Nigeria. Nigeria is one of the five countries with more than half of the world’s annual incident cases of pneumonia. It is estimated that every single day, 2,300 under-fives die in Nigeria (UNICEF 2015). Of these, about 328 die of pneumonia (Liu et al 2015). 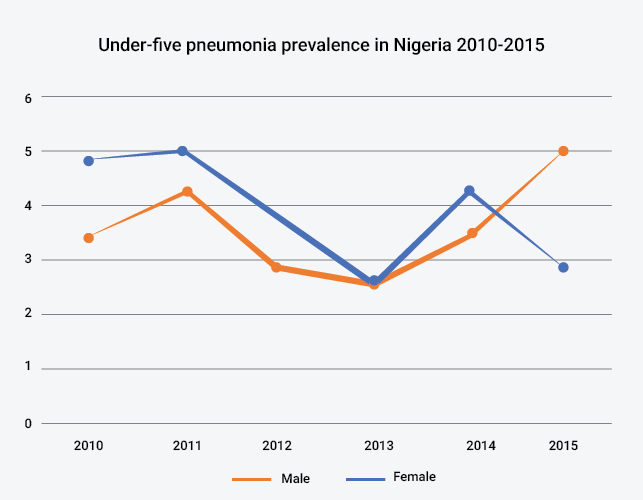 The figure above (fig 2) shows the prevalence of Pneumonia in under-five males and females from 2010 to 2015. As can be seen from the line chart (above), the progress on the control of pneumonia in Nigeria has been little and slow. It can also be seen that the same number of children died from pneumonia in 2014 as did in 2010. Malaria and Measles deaths on the other hand have fallen appreciably. In Nigeria, much of the literature since the mid-1990s has reported S. aureus and Klebsiella species as common causes of pneumonia in children (Aderele et al 1994; Diakparomre and Obi 1981; Aderele et al 1993). However, the general lack of methodological rigour may put into questions the results of these studies since most did not take into account the inclusion of undernourished children, the use of human blood for the preparation of blood agar and the use of antibiotics before medical consultation in the studies which may be the reason for the under-reporting of S. pneumonia and Hib infections. Several factors are known to be associated with transmission of Pneumonia in children. These are inhalation of second hand smoke, overcrowded and poorly ventilated homes and indoor air pollution (WHO 2016). Poverty is the dominant factor that links deaths from pneumonia in under-fives to other factors such as availability of clean, safe water and sanitation, poor nutrition and poor access to health care (WHO 2016). The first ever vaccine to protect against Pneumonia was developed in 1977 and was called the Pneumococcal Polysaccharide Vaccine (PPV). The pitfall of this vaccine was that it provided immunity to only a limited number of streptococcal serotypes (Edward 2004; Plotkin 2011) and its immunity is not long lasting. It is therefore not recommended for children younger than 2 years old but for persons 50 years or more (Zimmerman and Middleton 2011). However, in 2000 the Pneumococcal Conjugate Vaccine (PCV) was developed. This vaccine offers protection against 13 strains of the pneumococcal bacterium and it is believed to around 50% to 70% effective at preventing Pneumococcal disease (NHS 2017). Reduce new cases of severe pneumonia by 75% in under-fives compared to 2010 levels by 2025 (WHO/UNICEF 2013). Under five Pneumonia is addressed by the integrated framework of key interventions made available by GAPPD. The key interventions are designed to protect, prevent and treat Pneumonia. Use of vaccines against Streptococcus pneumonia and Haemophilus influenzae type b. PCV was launched into Nigeria’s routine immunization schedule in December 2014. Prevention of HIV transmission- Scaling up of prevention of mother-to-child transmission of HIV (PMTCT) services. Handwashing with soap and water and access to safe clean water. Initiating and maintaining effective case management strategies and promoting care-seeking behaviour and referral (WHO/UNICEF 2013). Nigeria is one of the 15 countries with the highest burden of pneumonia (WHO 2016). Others are India, Pakistan, the Democratic republic of Congo, Ethiopia, Angola, China, Afghanistan, Indonesia, Kenya, Sudan, Bangladesh, Niger, Chad and Uganda. Every year, the progress made by these 15 countries are assessed through the GAPPD scores which were developed by the International Vaccine Access Centre (IVAC). 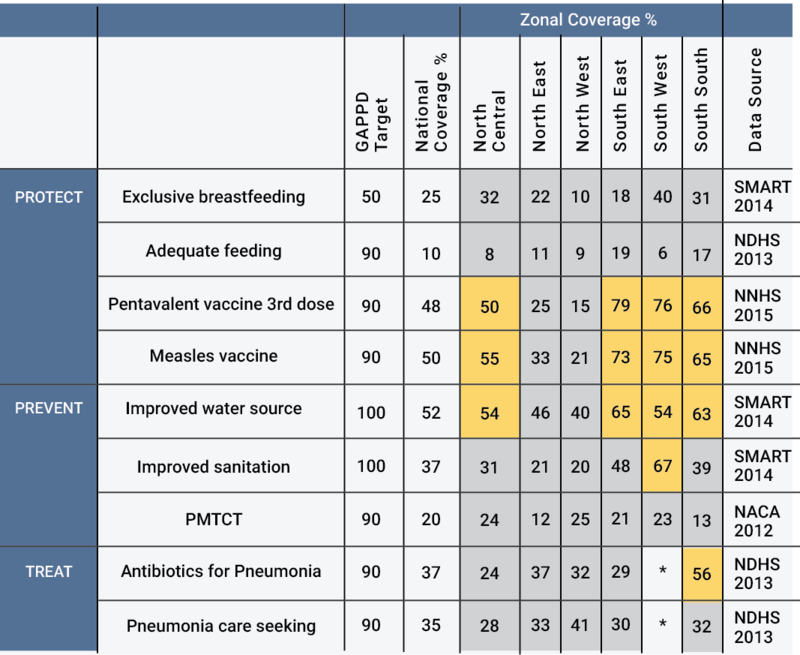 These scores were derived from an average of countries coverage levels across ten (10) key GAPPD indicators (8 for Pneumonia only) for which data are available (WHO/UNICEF 2013). These indicators were chosen based on their measurability, discreetness and public availability (WHO/UNICEF 2013). Table 1 presents the breakdown of the pneumonia score card in the 6 geopolitical regions of Nigeria. It is apparent from this table that very few regions satisfied the GAPPD target. What is striking also about these figures in this table is the disparity in regional differences of the indicators. While the South West, South South and South East region have better scores, the Northern regions have the lowest scores. Together, these results provide important insights into Nigeria’s high under-five mortality resulting from Pneumonia. It calls for urgent action from all levels, the government, the private sector as well as community leaders to strengthen Pneumonia control and tackle this disease that is taking the lives of under-fives in Nigeria. Pneumonia is treatable, a child does not have to die by seconds. Let us win the fight against Pneumonia! Aderele, W. I., Johnson, W. B. R., & Osinusi, K. (1992). Acute Klebsiella, Pseudomonas and Proteus pneumonia in childhood. Niger J Paediatr, 19, 80-8. Aderele, W. I., Osinusi, K., Johnson, W. B., & Rotowa, N. A. (1994). Staphylococcal lower respiratory infection in children. West African journal of medicine, 13(1), 7-12. Casadevall, A. (1996). Antibody-based therapies for emerging infectious diseases. Emerging infectious diseases, 2(3), 200. Casadevall, A., & Scharff, M. D. (1995). Return to the past: the case for antibody-based therapies in infectious diseases. Clinical infectious diseases, 21(1), 150-161. Diakparomre, M. A., & Obi, J. O. (1981). Aetiological diagnosis of pneumonia in childhood by lung puncture. Nigerian Journal of Paediatrics, 8, 61-4. Dowling, H. F. (1973). The rise and fall of pneumonia-control programs. The Journal of infectious diseases, 127(2), 201-206. Edwards, K. M. (2004). Pneumococcal infections: therapeutic strategies and pitfalls. In the Pneumococcus (pp. 314-330). American Society of Microbiology. Garenne, M., Ronsmans, C., & Campbell, H. (1992). The magnitude of mortality from acute respiratory infections in children under 5 years in developing countries. World health statistics quarterly, 45, 180-180. Golding, N., Burstein, R., Longbottom, J., Browne, A. J., Fullman, N., Osgood-Zimmerman, A., … & Dwyer-Lindgren, L. (2017). Mapping under-5 and neonatal mortality in Africa, 2000–15: a baseline analysis for the Sustainable Development Goals. The Lancet. IVAC Nigeria (2016). Pneumonia facts and figures: Nigeria. [online] Available at: https://dclnigeria.com/wp-content/uploads/2016/11/IVAC-Pneumonia-Fact-Sheet.pdf [Accessed 10 Nov. 2017]. Johnson, A. B., Osinusi, K., Aderele, W. I., & Adeyemi-Doro, F. A. B. (1993). Bacterial aetiology of acute lower respiratory infections in pre-school Nigerian children and comparative predictive features of bacteraemia and non-bacteraemia illnesses. Journal of Tropical Paediatrics, 39(2), 97-106. Leowski, J. (1986). Mortality from acute respiratory infections in children under 5 years of age: global estimates. Leung, D. T., Chisti, M. J., & Pavia, A. T. (2016). Prevention and Control of Childhood Pneumonia and Diarrhoea. Paediatric clinics of North America, 63(1), 67-79. Liu, L., Oza, S., Hogan, D., Chu, Y., Perin, J., Zhu, J., and Black, R. E. (2016). Global, regional, and national causes of under-5 mortality in 2000–15: an updated systematic analysis with implications for the Sustainable Development Goals. The Lancet, 388(10063), 3027-3035. NHS (2017). Pneumococcal vaccine – Vaccinations – NHS Choices. [online] Available at: https://www.nhs.uk/Conditions/vaccinations/Pages/pneumococcal-vaccination.aspx [Accessed 10 Nov. 2017]. Plotkin, S. A. (Ed.). (2011). History of vaccine development. Springer Science & Business Media. ReliefWeb (2017) Pneumonia and Diarrhea Progress Report 2014. [online] Available at: https://reliefweb.int/report/world/pneumonia-and-diarrhea-progress-report-2014 [Accessed 10 Nov. 2017]. UNICEF (2012). Pneumonia and diarrhoea: Tackling the deadliest diseases for the world’s poorest children. New York: UNICEF, 2-8. UNICEF (2016). UNICEF Nigeria – The children – Maternal and child health. [online] Available at: https://www.unicef.org/nigeria/children_1926.html [Accessed 9 Nov. 2017]. UNICEF (2017). Child Survival and the SDGs – UNICEF DATA. [online] Available at: http://data.unicef.org/topic/child-survival/child-survival-sdgs/# [Accessed 8 Nov. 2017]. UNICEF (2017). 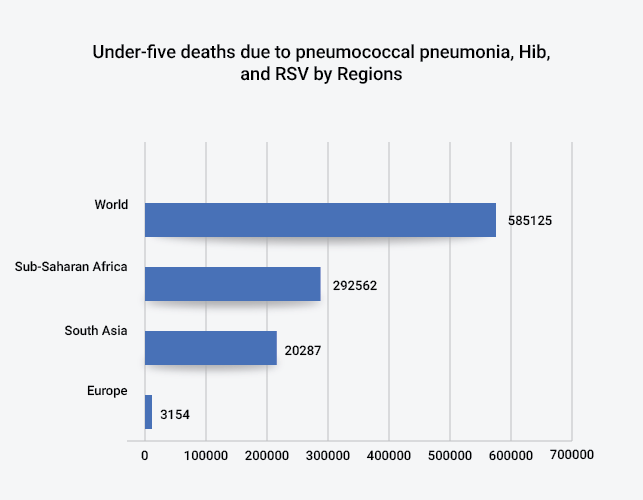 Pneumonia – UNICEF DATA. [online] Available at: https://data.unicef.org/topic/child-health/pneumonia/# [Accessed 2 Nov. 2017]. WHO and UNICEF (2013). Ending preventable child deaths from pneumonia and diarrhoea by 2025: The integrated Global Action Plan for Pneumonia and Diarrhoea (GAPPD). WHO and UNICEF. (2009). Global action plan for prevention and control of pneumonia (GAPP). WHO (2016). Pneumonia. [online] Available at: http://www.who.int/mediacentre/factsheets/fs331/en/ [Accessed 6 Nov. 2017]. Zimmerman R.K. and Middleton D.B. (2015). Chapter 7. Routine Childhood Vaccines | CURRENT Diagnosis & Treatment in Family Medicine, 3e | AccessMedicine | McGraw-Hill Medical. [online] Available at: http://accessmedicine.mhmedical.com/Content.aspx?bookId=377&sectionId=40349397 [Accessed 10 Nov. 2017].